Editor(s): Iono, D.; Tatematsu, K.; Wootten, A.; Testi, L.
The Atacama Large Millimeter/submillimeter Array (ALMA) has been producing a growing number of impressive and scientifically compelling results as the most powerful millimeter and submillimeter wavelength interferometer in the world. Held in central Tokyo, the aim of this four-day conference was to highlight the most recent science results from ALMA obtained during the first three years of science operations, and to motivate future collaboration among researchers around the world. The science topics included all fields of astronomy, from cosmology and galaxies in the distant universe, to nearby galaxies and the Galactic Center, the ISM and star formation in our own galaxy, astrochemistry, stellar evolution, circumstellar disks, exoplanets, the solar system, and the Sun. 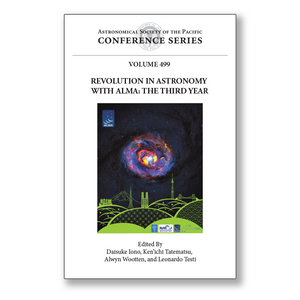 Results reported by the approximately 300 astronomers who attended may be found within this volume.